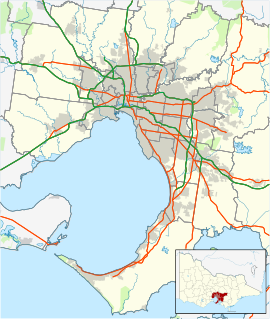 Berwick (/ˈbɛrɪk/) is a suburb in Melbourne, Victoria, Australia, 37 kilometres (23 mi) south-east of Melbourne's central business district. Its local government area is the City of Casey. At the 2016 Census, Berwick had a population of 47,674. It was named by an early leaseholder after Berwick-on-Tweed in Northumberland. The town of Berwick was originally part of the Cardinia Creek run. Subdivision started in 1854 and a store, post office, hotel and other businesses were established. Wheat, barley and potatoes were grown, with a flour mill operating for several years. Dairy farming and cheese making later became the main activities. The Berwick Agricultural Society, originally started in 1848 as the Mornington Farmers' Society, is one of the oldest farmers' societies in Victoria. The area grew with the construction of a coach road between Melbourne and the Gippsland region, the Post Office opening on 18 September 1858. A quarry opened in 1859 to supply ballast for the railway line along the same route, which opened in 1877, and a spur line was constructed to Berwick railway station to transport the metal. The site of the quarry is now occupied by Wilson Botanic Park. From 1861 until 1902, Berwick was also the headquarters of the Shire of Berwick, originally formed as the Berwick Roads Board. Poplar trees lining the High Street and on into Beaconsfield were planted as an Avenue of Honour to commemorate the fallen in the First World War. Originally name plaques were supposed to have been mounted at the foot of each tree but this was never carried out, despite the plaques being produced. Late in the 20th century Melbourne sprawled eastward to Berwick. The surrounding rural land was subdivided becoming a popular destination for first home buyers with the population exploding with new housing developments from the 1990s to the 2000s. Some of the character of the original township has remained. The Berwick Inn on the corner of High Street and Lyall Road, was licensed at Berwick in 1857 as the Border Hotel. The original one-storey section is now the bar. The two-storey section was added in 1877 as the railway approached. The western section was built later in the century. The first licensee was Robert Bain who owned the town's first store and post office and donated the land on which the shire hall was later built. The Border Hotel was an important local centre in the early days. Aside from being the first pub on the townsite it was also a stopping place for coaches en route to Gippsland, as it involved climbing the hill in Berwick the horses were watered and rested then they stopped at Beaconsfield over the hill to rest after the climb and descent. Bain was the first secretary of the Berwick Roads Board and its initial meetings were held at the hotel from 1862 to 1865. The first local police court was held at the hotel in 1865 and it also served as a licensing court. In the 2016 Census, there were 47,674 people in Berwick. 65.4% of people were born in Australia. The next most common countries of birth were England 4.6%, India 3.5%, Sri Lanka 3.1%, China 2.0% and New Zealand 1.8%. 73.3% of people only spoke English at home. Other languages spoken at home included Mandarin 3.0%, Sinhalese 2.8%, Hindi 1.0%, Italian 0.9% and Arabic 0.9%. The most common responses for religion were No Religion 29.3%, Catholic 25.8% and Anglican 10.6%. Berwick's census populations have been 60 (1861), 636 (1891), 887 (1954), 25,461, (2001), 36,420 (2006), 44,779 (2011) and 47,674 (2016). The town's first school, Berwick Primary, was originally established in an old shepherd’s hut near the old Berwick hospital in 1857. It was the first school in the Berwick area and school number 40 in Victoria. School buildings were later built on a triangular parcel of land between Peel Street and Harkaway Road. The school operated from this site until 2003 when a new school was built in Fairholme Boulevard. Subsequently, the Peel Street site was redeveloped as Pioneer Park, a community open space. The original school buildings were retained during the redevelopment and now operate as a restaurant. As well as the State School, a Boys' Grammar School operated from 1882 to 1922. St Margaret's Girls' School (originally called Berwick Presbyterian Girls' School) opened in 1920 with Junior boys being admitted during the 1960s. It ceased providing boarding placement in 1978, being one of the first of the St Margaret's Schools in the world to change. Berwick Secondary College and Kambrya College, public high schools, and the Village campus of Beaconhills College and the Berwick Campus of St. Francis Xavier College are located in the suburb. Berwick is also home to the third campus of Haileybury, Melbourne, Victoria, with the campus having been simply named 'Edrington'. Berwick Lodge Primary School also opened up in 1990, today being one of the best primary schools in Melbourne. In addition Berwick is also home to Victoria's first coeducational selective entry school, Nossal High School. 59.0% of people living in Berwick are employed full-time, 31.0% employed part-time. Berwick has a lower than average unemployment rate at 5.8% as compared to the Victorian average of 6.6%. People in Berwick also have a higher than median household income, at $1,746 per week. The most common occupations are Professionals 20.6%, Clerical and Administrative Workers 15.9%, Technicians and Trades Workers 14.6%, Managers 13.7%, and Sales Workers 10.9%. Berwick also has adult education facilities, including Chisholm Institute of TAFE and a sizable campus of Federation University Australia, formerly a Monash University campus until 2017. Berwick has its own large retailers, including a Woolworths, 3 Coles and an Aldi. Many small shops and businesses are also situated along the shopping precinct on old Princes Highway (Main street of Berwick village). These shops include a selection of restaurants, cafés, and other services including a library and post office. Further south on Clyde Rd is the Eden Rise Shopping Centre which is the largest shopping complex within Berwick. Along the main road are also a few car dealerships, starting from Berwick to the Fountain Gate. Berwick has a train station and bus network. Due to poor public transport infrastructure, Berwick is a car-dependant suburb, with 77.7% of people using a car to travel to work, compared to the Victorian average of 68.3%. Berwick currently has 2 hospitals, Casey Hospital and St. John of God Berwick with a second St. John of God Berwick Hospital currently being constructed and due to be completed in 2017, opposite Casey Hospital on Kangan Drive. The house value in Berwick has a median $713,382 and units are $505,223, which is very expensive compared to other suburbs. The town has an Australian Rules football team competing in the Mornington Peninsula Nepean Football League and an Association football team called Berwick City Football Club. The town also has a successful cricket club known as the "Wickers" and later changed to the Berwick Bears that compete in the DDCA competition and a tennis club that competes in the BDTA (Berwick & District Tennis Association). Golfers play at the Berwick-Montuna Golf Club on Emerald-Beaconsfield Road, Guys Hill. There is also Little Athletics at Edwin Flack Reserve. Berwick is in the coverage range of all the commercial radio stations in Melbourne, yet are also locally serviced by 94.3 Star FM, whose studios are situated in Warragul. The Berwick Mechanics' Institute and Free Library was built in 1862 at the corner of Peel and Edward Streets. In return for a nominal rent Robert Bain agreed, in 1878, to lease a block of his land to the library for 500 years, so long as a library remained on the property for that period. In 1880 it was moved to its present site in the main street and extended the following year. Berwick was also the home of Edwin "Teddy" Flack, Australia's first Olympian and Olympic gold medal winner (800 metres (870 yd) and 1,500 metres (1,600 yd)) at the inaugural Athens Olympic Games. He was laid to rest in Berwick Cemetery, and is commemorated by a statue in the main street. The Edwin Flack Reserve includes several sporting grounds, such as the Edwin Flack Oval, Edwin Flack Athletics Track and Edwin Flack Netball Courts, all named in his honour. They are located alongside Berwick Secondary College. Richard Casey, later Baron Casey of Berwick and Governor-General of Australia was a resident of Berwick. His home of Edrington has now been converted to an aged care facility. Gagan Scott McDonald, Australian International football (soccer) player, striker for Celtic FC in Scotland and top scorer in the Scottish Premier League in the 2007–08 season grew up in Berwick. Former AFL games record holder Michael Tuck and former Hawthorn defender Mark Graham hail from Berwick as does 2009 number one draft pick Tom Scully and Brisbane Lions ruckman Stefan Martin. Berwick is also known for being the birthplace of Benjamin Alan Robert Storer (voice and creator of Bob the Bandage Bear), son of Lesliy Thomas Storer (famous Melbourne trucking identity) and father of Dylan Thomas Storer (northwest media personality). Wikimedia Commons has media related to Berwick, Victoria. ^ a b c d e Australian Bureau of Statistics (27 June 2017). "Berwick (State Suburb)". 2016 Census QuickStats. Retrieved 17 November 2017. ^ Monash University. "Australian Places - Berwick". Archived from the original on 19 November 2004. ^ . Australian Bureau of Statistics (9 March 2006). "Berwick (State Suburb)". 2001 Census QuickStats. Retrieved 15 September 2007. ^ Australian Bureau of Statistics (25 October 2007). "Berwick (State Suburb)". 2006 Census QuickStats. Retrieved 15 September 2007. ^ Berwick Primary School. "Berwick Primary School - Our History". Retrieved 14 September 2007. ^ Golf Select. "Berwick-Montuna". Retrieved 11 May 2009. ^ "Edwin Flack - Our first Olympic champion". City of Casey. Archived from the original on 1 September 2007. Retrieved 14 September 2007. ^ "Subscribe to the Herald Sun". www.heraldsun.com.au. Retrieved 23 September 2016. Beaumont, N.E. "Early days of Berwick and its surrounding districts of Beaconsfield, Upper Beaconsfield, Harkaway, Narre Warren and Narre Warren North". 3rd ed. 1979. Berwick-Pakenham Historical Society. "In the wake of the pack tracks: a history of the Shire of Berwick, now the City of Berwick and the Shire of Pakenham". 1982. Wells, J.C. "Berwick: some aspects". 1980. This page was last edited on 16 April 2019, at 08:46 (UTC).